The 33rd Barry 40 mile, ironically the thought of running a track race with a 161 laps is a scary thought and always swore I wouldn’t do this. Mainly down to how it may have potentially caused some issues with my feet and legs with constant turns. 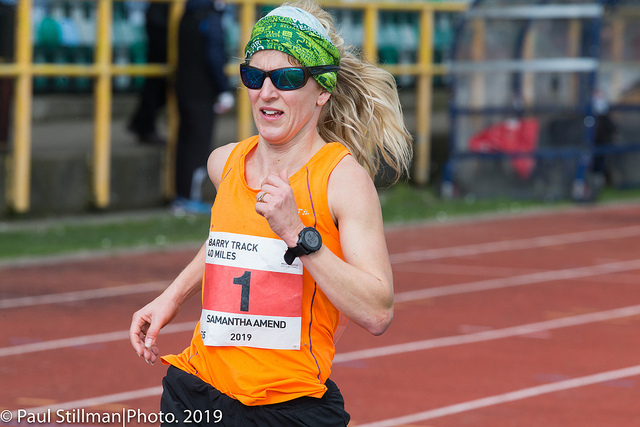 Anyway, decision was made with the coach at the back end of 2018 that it fitted well in the training in preparation for the 6hr track British record and also long training for GB 24hr. Honestly from the start of 2019 this had always been the one race I was worried about as I know the weather is not great on coasts. Being British, let’s talk about the weather for a moment. According to the Race Director Mick he said the weather for this year’s race was far from kind, with strong north-westerly winds throughout and the worst he could recall. It makes me feel better knowing that I couldn’t have done anymore and the weather played a detrimental part. There were also other practical implications too when the sit in football dugout blew across in front of us with the high gusts of winds, cones knocking down and across the track and some hail for good measures. 18 of us entered the two events (11 in the 40 miles) and 7 in the marathon, and everyone turned up for the start, it was a battle of who would get to that finish line. The start was fast, with James who had been twice a previous winner and closely running alongside Grant Jean who ultimately ended up not finishing his race from some miles 6 min miling. I was part of a controlled quartet containing a Norwegian local Ake Fagereng (Les Croupiers), Richard Elgar (Lliswerry Runners and brother to the eventual winner) and Richard Fowler (Parc Bryn Bach). We shared the pace and the front of the group for the first 12 or so miles before we started to all have gaps grow as we settled into our own paces. It was really tough for us as we were continually lapping others who were walking the inside line and no energy to shout to move it was too much as it was so frequent. Head down and motored around the laps and didn’t really start to count until we had done 20 miles. By 30 miles the leader held a 12 minute advantage with Nathan Flear ( running 100k a few weeks later) was hanging in second. Ake Fagereng was in (3:35:07) and my time (3:38:39) for 30 miles and we had also been running solo for some time. I plugged away and tried not to loose too much time and completed my penultimate lap with my niece chasing me to finish. Lots of lessons learned, experiences, challenges and surprisingly came away unscathed and considering a return. It was a friendly event and relaxed and very supportive event. I never forget we runners renamed Barry Island “Barrybados “ as it was anything far from it. I was pleased with my performance and will be back to run faster !